Behold, one of my websites. 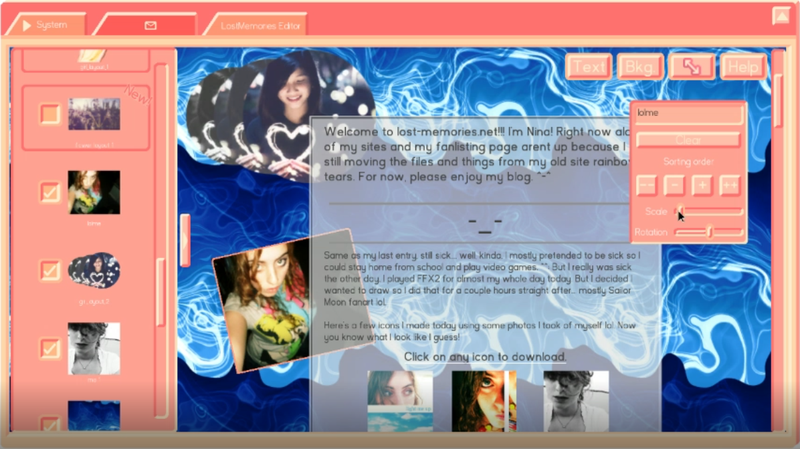 In developer Nina Freeman’s newest game, Lost Memories Dot Net, you play as a 14-year-old girl building her own blog while navigating the social drama wasteland that was middle school in the year 2004. Originally commissioned for the Manchester International Festival, you “play a role based on the young Freeman.” The game centers on a love triangle between protagonist Nina, her friend Amy, and her other friend, Jared. Both Amy and Nina like Jared, but Nina doesn’t want to create a rift in her friendship with Amy by admitting it. Nina vents to her online friend, Kayla, about this situation. As Nina, you build your website and also make dialogue choices in the online chat room while conversing with her friends. The game takes place in three parts, each of which is a different day in April. Nina talks to her friends online about her life by selecting from two different dialogue options. Nina talks to her friend Kayla in an online chatroom. Nina and her friends, Amy and Kayla, talk about boys constantly, treating them like they are magical unicorns instead of actual humans. While this captures what it can be like to be a young girl, these conversations drag on and slow down the story’s action. The interpersonal drama that drives the story gets lost in the characters’ constant rehashing of events, with no plot decisions made until the very end. The game only takes two hours to play, but the repetitive nature of each act made it feel much longer. The game gives you dialogue options when talking to Nina’s friends online. The choice-making mechanic didn’t have results I expected: although I selected options that I thought would steer Nina away from Jared, she continued to pout about how much she liked him and how she could never be with him. Amy asked Nina to set her up with Jared, but because Nina expressed that it hurt her to set Amy up with the boy she loved, I wanted to avoid that. Throughout the game, Amy wants Nina to help her talk to Jared. I didn’t think she needed Nina’s help, but she insisted. I wanted the option for Nina to adamantly refuse or reluctantly agree, but that wasn’t a choice. Nina doesn’t stand up for herself because she says she doesn’t want to start drama, yet she posts about Amy on her blog and talks about her with Kayla. Besides being inconsistent with her motivation, I was frustrated that the game steered me in a specific direction despite seeming to present choices. Though friendship is supposed to be the tension at the center of Lost Memories Dot Net, it’s never satisfyingly portrayed. Nina draws away from Amy as Amy becomes closer to Jared, but Kayla never stops asking Nina about her feelings and sympathizing with her. At one point, Nina gets depressed, so Amy invites Nina to sleep over at her house to cheer her up. But ultimately, Amy remains clueless about Nina’s feelings toward Jared throughout. Additionally, Amy drags Nina into awkward situations with boys, trying to set Nina up with them even when they reject her. Amy is much more concerned with boys than how her friend feels, but Nina never confronts her about it. I wanted Nina and Amy’s friendship to come to a breaking point, but in the end they never confront each other and the conflict is just swept under the rug. As a result, the tension between Nina and Amy remains, and there isn’t a climax or emotional release for the player. The moments I most felt for Nina were when she was dealing with things other than boys, especially her family or her mental health. Nina tells Kayla and Amy about her parents’ fights and their aggressive behavior toward her. At times, when Nina described her life, I felt like she was living in a warzone. In turn, Nina acts out, at one point stealing her dad’s credit card to buy the domain name for her website. But she’s still unable to escape the sadness and loneliness she experiences. These were the moments when I empathized with Nina, instead of when she was whining about some boy she probably won’t remember in five years. The actual mechanics of the game are also strong, especially parts where you design a website. While you wait for Nina’s friends to respond to her messages, you can build a website for Nina. You can also visit other websites in the game and download images to use for your own site. I made the worst site possible to see if the characters would react to it. They didn’t, but I still had a lot of fun. The game’s IM mechanic is also enjoyable. Nina’s friends have screen names like uu_hack_fo_sho (a clever play on words of YuYu Haksuho) and xXx_Sephiroth_xXx, or more simple ones like ColonelSad. The IMs not only drive the plot along, but they capture the essence of that middle school time period. I truly felt like I was 14 again. While Lost Memories Dot Net’s plot failed to strike a chord with me, the IM and website designing mechanics were entertaining. However, they weren’t enough to make up for the lackluster storyline, which failed to adequately address its central themes. It did, however, make me glad I’m not in middle school anymore.